Hans and I were in the mood for tortilla soup. Most recipes that we came across online were not vegetarian-friendly. So we decided to come up with our own recipe. So we choose the ingredients (including veggies and spices) and just trusted in the Dutch oven magic. Anything that is cooked in a Dutch oven, will by default be amazing, right?! 1. Add all ingredients into the seasoned Dutch oven (8 inch). 2. Place Dutch oven on hot coals and heat, stirring occasionally, for 30 minutes. 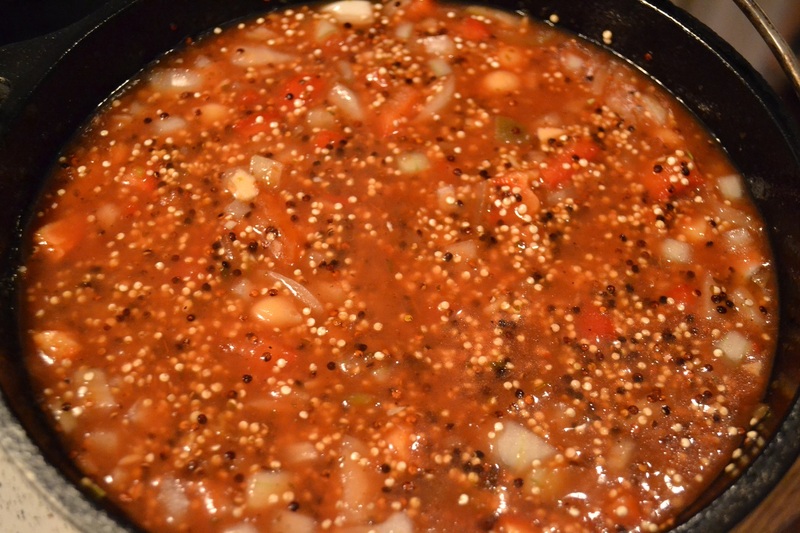 The quinoa is fully done, when the grain looks translucent and the white-germ has partially detached itself, appearing like a white-spiraled tail. 3. Enjoy with cheese quesadilla. Note: This recipe can be adapted to accommodate whatever you can find in your pantry. Need to use up potatoes and carrots. Just cut them into small pieces and add to the Dutch oven. No salsa, just use a can of cut tomatoes instead. Don’t like garbanzo beans, just use kidney beans. I would suggest buying organic tomatoes and beans, so you will not have to drain either can before adding them to the dutch oven. For another example, see Tortilla Soup Version 2. * Quinoa is glutenfree and rich in protein. It is also a good source of essential amino acids like lysine and acceptable quantities of calcium, phosphorus, and iron. 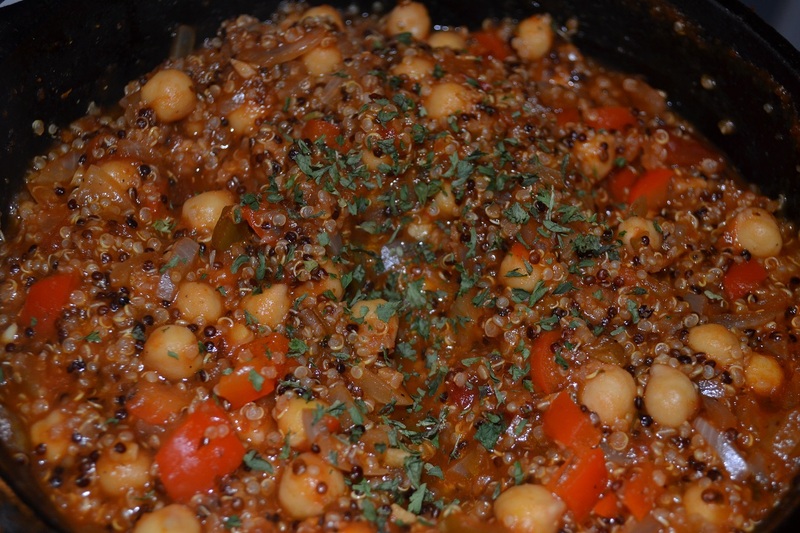 * Chickpeas are a great source of protein. 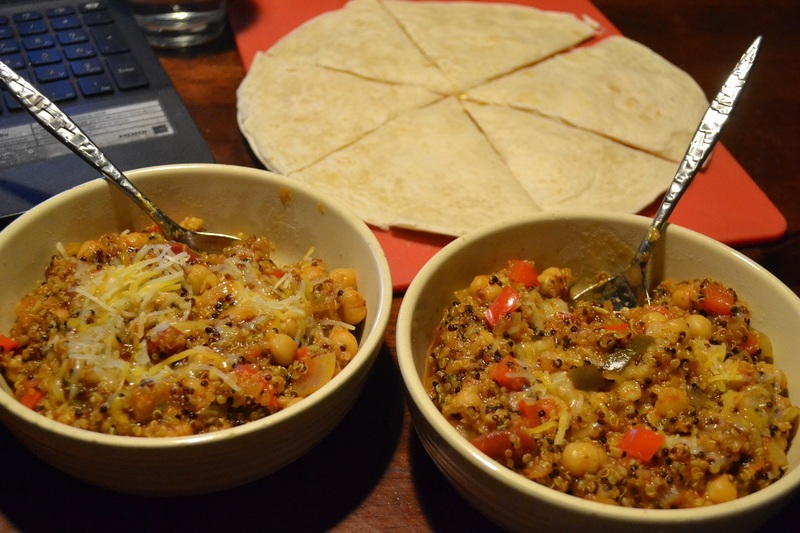 Categories: Dutch Oven, Dutch Oven Dinners | Tags: camping, chickpeas, dutch oven, garbanzo beans, pepper, quinoa, soup, vegan, vegetarian, year-round | Permalink.